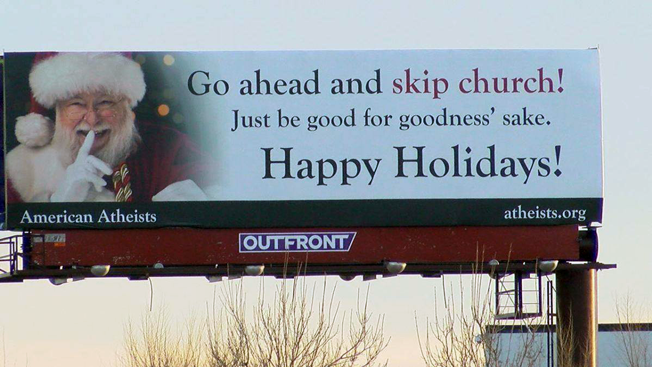 There’s been some recent buzz regarding a billboard that was put up by the American Atheists that told people to skip church on Christmas. Obviously, there will be some backlash from Christians who are, once again, upset that Christ is being taken out of Christmas. Articles on Facebook will circulate that will tell us why this is all due to President Obama wanting to allow Syrian refugees into America to strip us of our religious rights after he called the Christmas tree the Holiday tree…or something along those lines. Petitions will be signed. Arguments will be had. And in the process, zero people will change their minds. But for once, I agree with the American Atheists: skip church on Christmas. Let me be clear on one thing: this isn’t about how some people only go to church on Christmas and Easter. I’m not saying if you don’t go every week, you shouldn’t go at all. Some people go every week and do nothing at all. In my book, those who don’t go at all are better than those who do and do nothing. Why do I agree with the American Atheists? If you’re going to go to church to become good, then go ahead and skip church on Christmas. The American evangelical church is plagued with this idea that all of our sermons should be something about how we can become better people. If your view of church is a place where it teaches us, “how to become better people,” then I think you’re misunderstanding the point of the body of Christ. This isn’t the fault of the atheists. The American evangelical church has done quite a bit to show people that our only concern is to help people become better. A quick glance through the Christian bestsellers will show you a handful of books that borderline self-help rubbish. And this is what people want to hear. Just because this is what people want to hear doesn’t mean it’s what we should be saying. We spend quite a bit of time crafting messages that will make people feel like they can become better and in the process of doing so, we remove any need for Christ. We hear these kinds of sermons all the time. And so, to the outside world, the church exists to help people become better versions of themselves. But the church can’t exist to do this. The church has to exist for something more. And if people see the church’s purpose as that, then I apologize, because that’s not what we are about at all. As simple as it sounds, we are about Christ. That’s it. We’re not about becoming good. We’re about recognizing our brokenness and Christ’s wholeness. We celebrate this through the Eucharist each week. Christ, in His brokenness, became whole and we, by consuming the emblems, recognize that and celebrate that. 1.) Since we’re great at boycotting things (I get emails all the time), boycott buying books from Christian authors that propagate this self-help ideology. 2.) For once, don’t find a way to blame the godlessness in America for every “wrong” perception about the church. Let’s own up to our mistakes. 3.) Stay clear of click bait articles from people who just want to start a holy war. Don’t click on them. Don’t share them. Report them for spam. Because in my opinion, that’s all they are. Spam. 4.) Continuously remind your friends who don’t go to church that it is not a place to become good. That goes completely against the Gospel. Be transparent and open about your own failings. 5.) If you do, by chance, go to church only to get your life in order, can I challenge you to rethink that position? Perhaps try going to church to celebrate what Christ has done and what that means for the world. Celebrate your brokenness because Christ didn’t come for the healthy, but the sick. I’ll say it one more time: Don’t go to church this Christmas if you’re going to become a better person. Go to church this Christmas to celebrate the incarnation of Christ and the hope that brings to the world.